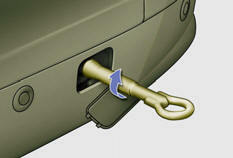 The towing eye is installed in the lefthand side trim of the boot. remove the towing eye from the same support. On the front bumper, unclip the cover by pressing it on the left. 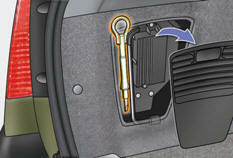 Place the gear lever in neutral (position N on the automatic gearbox). Failure to observe this instruction could result in damage to certain components (braking, transmission..) and the absence of braking assistance the next time the engine is started. On the rear bumper, unclip the cover by pressing it on the left.